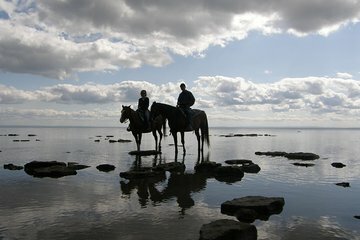 Évadez-vous des sites touristiques surpeuplés et découvrez le grand air près des chutes du Niagara emblématiques en effectuant une promenade de 90 minutes à cheval sur les plages de la région de Niagara. Sous la conduite de guides expérimentés et de gentils chevaux, explorez la zone de conservation des zones humides de Wainfleet et la magnifique campagne de l'Ontario, au Canada. Après quelques instructions, suivez une partie de la seule zone humide de tourbière de la péninsule du Niagara. Parfait pour les débutants et les riders expérimentés. L'utilisation d'un casque est incluse si vous le souhaitez. 1st timers! And 1 experienced rider with us, and he confirmed this was well worth every effort! We learned how to communicate with the horses we rode, and the lay out was beautiful! The ladies who work there are all wonderful, patient, and knowledgeable people. Definitely recommend checking out and soaking in the beauty of it all! We'll be back! Well worth the time and the money! I have been on other trails before but this by far was the best! The horses were not only trained to walk behind each other they were trained to gallop and stop all together! The staff was accommodating and extremely pleasant. It’s a must do ! Perfect for everyone I had a 9 year old and the staff was really helpful with him. It was our first time ever riding a horse. The horses were trained really well. My favorite part was the walk along the lake. I was so perfect and beautiful and the staff helped us and took our picture. The horses was not bothered by the water either. Just enough ride for me but the kids completely enjoyed it! What a fantastic experience! My sister and I had an amazing time! Our tour guide was very good and took us all around, explaining everything from fields, to the berries on the trees. I would absolutely go back the next time I'm in town. I would definitely recommend wearing pants and sneakers considering the ride through the woods and high grassy areas. Great time! Very worthwhile. Horses were healthy and happy. Beautiful scenery and much fun riding through Lake Erie. The horses were all rescue animals, the guides went out of their way to make sure that we were able to enjoy the experience.